I love white pizzas as I'm not a huge fan of pizza sauce. I don't necessarily dislike sauce, but there have been too many occasions where I've had a pizza with waaay too much sauce for my liking. Perhaps that's because my parents love to order their pizza with extra sauce and naturally growing up I ate what my parents put on my plate. My husband, however, won't even try a white pizza. He doesn't like a lot of sauce either (don't we work well together?!! ), but he doesn't like to think outside the box much. Lately I've been making a lot of smaller pizzas so we can both have what we want. Not too long ago I threw together what is, in my opinion, the perfect pizza. 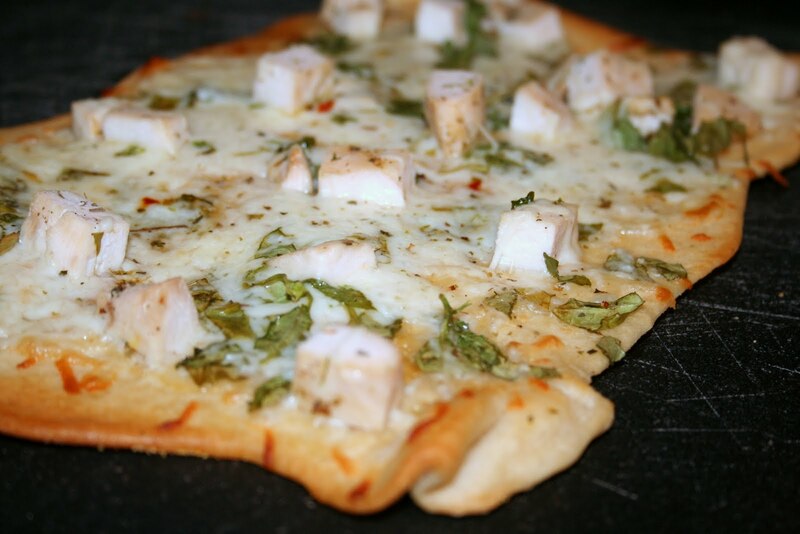 Garlic Olive Oil Sauce, cheese, spinach, basil and grilled chicken. Um, hello deliciousness; I love you! Cook pizza dough as directed on it's directions. Brush liberally with garlic olive oil. 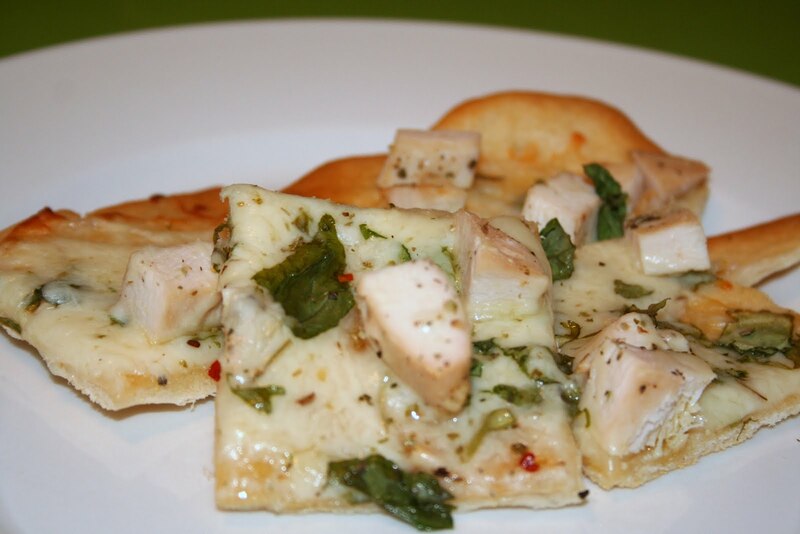 In a medium bowl, mix together cheese, chicken, spinach and basil. Sprinkle evenly on top of the crust and sprinkle with pepper flakes. Bake in oven until dough is cooked through and/or until cheese is melted. That looks tasty!! I will have to try adding chicken and spinach to my white pizza. I typically just use the ricotta and mozzarella. I like the idea of simmering the garlic and olive oil together. I like to throw some garlic and olive oil in the processor together and brush that on! This pizza looks great. It would be so easy to throw together the next time I have leftover chicken. I wanted to let you know that I nominated you for a blog award! My blog?! Seriously? How sweet of you. Thanks so much!